The Fully Automatic Press Tower System is designed to handle products before and after cooking. The strength of the fully automatic press tower system for ham production is automation with full process control. In this flexible production system, meat in calibrated molds is exposed to constant and yet flexible pressure during cooking and cooling. This results in products with high slicing yields. The system offers high product flexibility together with the possibility of various product sizes and shapes. The press towers work in conjunction with water or steam cooking systems. Each tower is spring-loaded. This creates a constant and yet flexible pressure during cooking/chilling. The 9 to 12 springs installed in the press towers, each exerting 1100 lb force (500 kg), to produce consistent pressure of approximately 6.4 psi (0.44 bars) at the top as well as at the bottom. The expansion and reduction of the meat during cooking and cooling is absorbed by the springs. The SCADA system option comes with a transducer built into each press tower or mold if required. This offers the possibility of tracking product data such as batch number, production period as well as cooking and cooling temperatures and times. In conjunction with the demolding process, it is possible to print product data and affix labels to the individual hams or containers. The highest degree of product uniformity is achieved with constant spring force from the upper frame applied during cooking/cooling. Give-aways caused by lack of meat uniformity are avoided as calibrated reinforced molds are used. A separate mold rinsing machine rinses out the molds and turns them upside down to drain any water automatically. 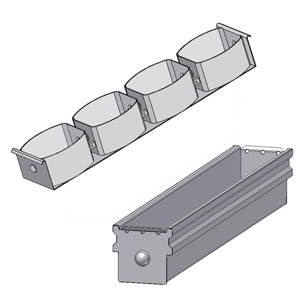 Molds available in various shapes and sizes to meet your needs. The equipment conforms to the strictest rules for a safe working environment. The equipment is CE-marked and complies with HACCP regulations. AISI 304 stainless steel, glass bead blasted surface. Massaged meat is pumped to a vacuum filling system and from here dosed into cooking film and clipped. From the filling system, the meat passes through a flattening unit. An operator transfers a lock to the mold and ensures a clip at each end. The filled mold goes onto an elevator. When one layer of molds is filled, the elevator deposits it into the press tower. When the tower is filled, the hydraulic press closes and locks the tower. At this time each piece of meat is subjected to a pressure of about 6.4 psi (4,500 kg/square meter). After the tower closes, the walking beam automatically transports it to the cooking area (tank or steam cooking). After cooking, the meat cools in the tower. After cooling, the tower is transported on the walking beam to the demolding area. A layer of molds is automatically left on the lifting table and enters the demolder where the molds are emptied using vacuum and compressed air. The cooked meat is conveyed to a cooling facility. After rinsing, the molds return to the system and the cycle can repeat with filling product. Download the Fully Automatic Press Tower PDF brochure.